Alright, here they are, members of the the First Company outfitted in Terminator armour wielding their preferred weapons, Thunderhammers and Storm Shields. First, let me apologize because I don't have any real WIP shots of these guys. Work has been frantic and fast paced as I've been juggling lots of things at once. You can however, click on any of the images in this post to look at the larger version. That way you can see all the detail that's gone into these guys. To be honest, I don't even know where to begin with these guys. It's a collection of bits, greenstuff and some plasticard. The bases are from Secret Weapon and the whole army is on them. I have no idea where the Thunderhammer heads came from. The storm shields started as Fantasy Chaos shields I think... at least that's the kind of iconography I scraped off all of them. I took some inspiration from Forge World when it came to their shoulderpads in that I tried to make 5 different shoulders so each guy's shoulder design was unique. Where possible, I tried to carry that theme onto their individual storm shields as well. The Sergeant took some work to build his weapon and shield arm, but I wanted him to be different from the rest of them. 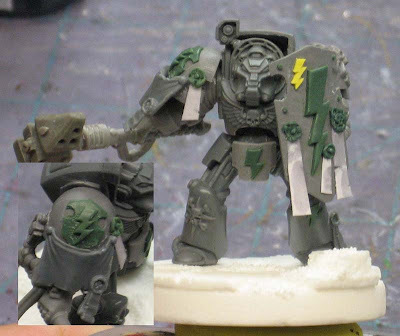 One of the squad members also has a Deathwatch shoulderpad (but I realize it's hard to see now) as a nod to the upcoming Deathwatch RPG by Fantasy Flight games. I suppose we'll see how well they really look once they're painted. That is some stellar modeling there! Um... WOW! These are incredible models! I look forward to seeing them finished. Paul: Thanks, I'm back in the running with the other guys now... I don't hate them all so much now. Those are looking great Ron, I think the hate pendulum just made a giant swing! Dying by the details goes a long way here, I love your GS laurel wreaths, braided ropes, and other extras. It would've been easy to dismiss them, but they would have suffered in the end. The switched up hammer-heads are also a nice touch. Those look fantastic, man! Can't wait to see them painted up. Great looking models! I really like the work you did on the shoulder pads. 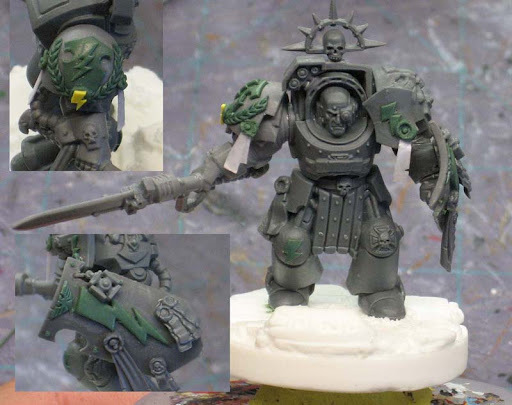 You weren't kidding, those termies look ace. 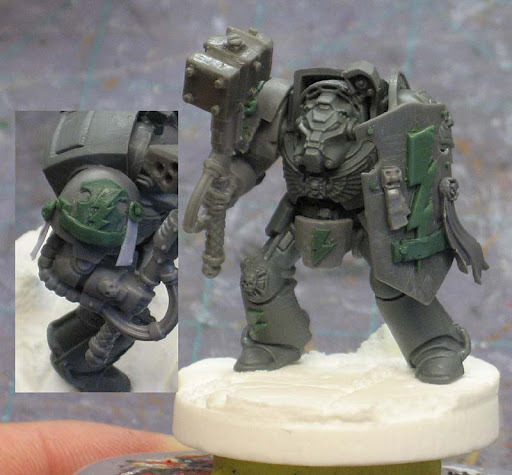 They have a very distinct and much more elite feel to them compared to normal terminators. And all of that without going overboard on the symbols and icons. The hammer heads looks great as well, I've seen them somewhere before but I can't place them either. Thanks guys, the real proof will be when I get one painted up and we can see how he turns out. Excellent work Ron, I believe its safe to say that we all knew that you'd catch up and do a stellar job! Ron, you have been busy, they are looking awesome. The hammer heads are from MaxMini Mechanical hammers, from the conversion bits line, lots of fine stuff from them. You have done the chapter proud. Great job, GS work is top notch. I hope i can win this drawing. Simply outstanding work Ron! I love the big shields and the flair you've added to them? That should read: I love the big shields and the flair you've added to them! 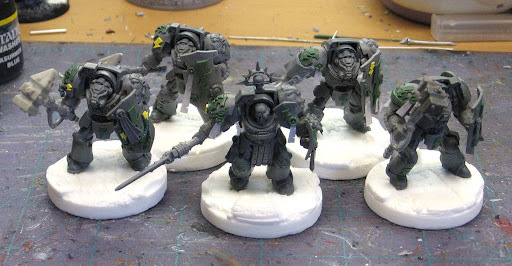 They look amazing, you have really inspired me to try out some greenstuff on my Imperial Fists Terminators. The GS laurel on the storm shield looks amazing. I love the effect. These feel like forge world models to me in their individuality.This is going to be a gorgeous army to field. Great job on them. However, why is there a sword on the Sarge? Isn't the whole unit TH/SS, not 4 TH/SS troops with a PW/SS Captain? They look fantastic. Love your GS work, they really make the models seem like a cohesive whole whilst maintaining an individual look on all of them. Can't wait to see them painted. Really nice work as others have said. 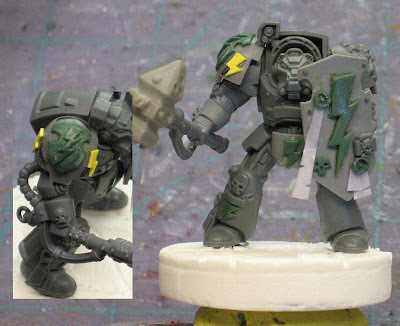 I am considering using the Warriors of Chaos shields you've got there as the base for some Blood Angel storm shields I am working on. What did you do about the hand though- I understand the terminator kit comes with a hand molded to the shield? Ron, wonderful models you have built, now I want to personalize my terminators like them, only Ultramarines of course. Amazing. Why were you getting all worked up, Ron? Thanks guys, i'm just trying to keep up with the rest of the guys. John: I saw what you guys were doing with your models and I knew I had to up the ante a bit with my guys just to keep up. 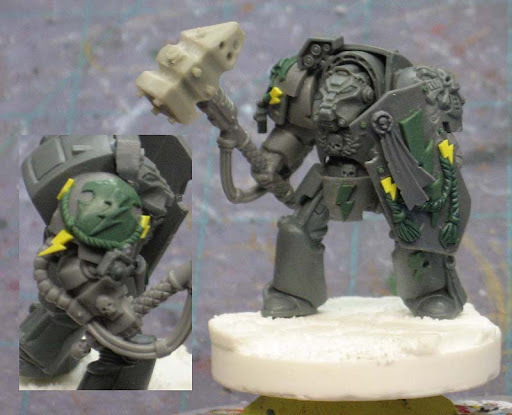 Anon: The power weapon will "counts as" a thunderhammer since it fits with their fluff we were given and I wanted to add a little something extra to the Sergeant. Keth: I just had to cut away the part of the arm that was molded on the inside of the Fantasy shield. I left the hand in place but carefully cut away the arm portion. That way it matched up with the terminator storm shield arm. Those are looking really solid right now, and your work with the green stuff is very nice. Cannot wait to see them all painted up. Fantastic work, as always. I am really looking forward to seeing them painted. Also, do you know how much money the raffle has earned so far? Thanks guys, I'm hoping to get one or more of them painted this weekend. I've got some other projects I'm working on as well so I need to juggle between all of them, but I'm dying to get one painted up to see he turns out. As for how much money has come in, I don't know. I do know there has been a huge outpouring of support both in Sponsors (for things like weekly giveaways) and people simply donating to the cause who aren't even interested in winning the army. Ultimately, I think just that fact that we are going to pull this off and it will raise some money for Doctors Without Borders makes it a success. I think we may not know "how much" until the very end. What is the sergeant's weapon made from? I love it! Josiah: It's the regular Sergeant thunderhammer with the head cut off and replaced with a power sword. Depending on what blade you add, you can get all kinds of different results. How do you work with green stuff so well? The few times I have used it, it was messy looking and wasn't flat like yours. Ph0n1k: Thanks. I accidentally reposted this as I was cleaning up some of the archives. HiveTyrant36: Patience and practice. Start with small objects and work your way up to larger elements. It really just takes time doing it.